I took the "Peacock Hall Energy Challenge"! "Economics seniors present at Undergraduate Research and Creativity Symposium"
Appalachian State University seniors Alaina Doyle and Anthony Santelle traveled to Campbell University November 4 to present their research at the State of North Carolina Undergraduate Research and Creativity Symposium (SNCURCS). SNCURCS provides undergraduate scholars in all fields an annual forum to share the results of their work through posters, presentations, performances and works of art, showcasing North Carolina undergraduate student research and creativity. Both Doyle and Santelle are earning a Bachelor of Arts degree in Economics through the Walker College of Business. Doyle, a senior Religious Studies and General Economics double major and Mathematics minor from Cary, NC, presented "Validity of discount rates derived from willingness to pay for road salt run-off mitigation dependent upon payment schedule." Santelle, a senior Environmental Economics & Policy major and Appropriate Technology minor from Waxhaw, NC, presented "Contingent Valuation of a Forest Protection Program in Southern Appalachian Mountains." Both students were mentored by Economics Professor John Whitehead. "Alaina and Anthony worked hard, developed some interesting and policy-relevant research results, and capitalized on an opportunity to network with other outstanding undergraduates," said Whitehead. "The students really did a nice job and were very excited and grateful for the opportunity," added a conference organizer. Both of these projects were out-of-the-classroom research experiences. Actually, they took a 1 semester hour independent study but these was an extra hour they didn't need to graduate. Stated preference discrete choice experiments (DCE) are increasingly being used by researchers seeking to understand consumer preferences and values in environmental economics, transportation, health, and marketing. An active DCE research area relates to behaviors that break from the assumptions of fully compensatory behavior assumed in standard discrete choice models. This has led to research on ways of incorporating heuristics and cognitive processes in models of DCE response behavior. In particular, considerable attention in recent years has been on attribute non-attendance (AN-A)--a type of choice behavior where individuals ignore one or more attributes in the DCE question. 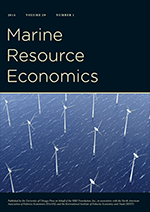 Marine Resource Economics is soliciting contributions for a special issue on the topic of AN-A in choice experiments of marine ecosystem goods and services in Volume 34 (2019). We welcome submissions that are empirical, theoretical, or both and advance our understanding of AN-A as it is applied to marine ecosystem goods and services (marine habitats, coastal ecosystem services, recreational activities, threatened and endangered species, etc.). Comparison studies: There are numerous ways for accounting for AN-A behavior in the literature and that generally can be classified as either stated or inferred approaches. Studies comparing AN-A approaches (stated versus inferred, alternative inferred approaches, joint versus separate, etc.) are welcome. Case studies: There have been a number of AN-A articles published in the areas of agriculture, environment, health, and transportation. The editors seek case studies focused on marine ecosystem goods and services. Replications: There have been a number of stated preference articles addressing marine ecosystem goods and services over the years. The editors seek re-examinations of these older, published studies with AN-A methods. Policy studies: How does AN-A affect benefit-cost, resource allocation, natural resource damage assessment, or other types of policy? AN-A may alter willingness to pay estimates. When there is AN-A on the cost coefficient, willingness to pay is biased upwards. When there is AN-A on an attribute coefficient, willingness to pay is biased downward. Should AN-A willingness to pay estimates be used as base case estimates or as alternatives in sensitivity analysis? Meta-analyses and benefit transfer studies are also welcome. Exploratory studies: Studies exploring the theoretical and empirical bases of AN-A behavior and factors affecting it are also encouraged. If interested, please send an abstract to the special issue guest editors (Dan Lew, [email protected]; John Whitehead, [email protected]) by May 25, 2018, for preliminary review. Selected abstract authors will be asked to submit papers for the special issue through the Journal’s website (https://www.journals.uchicago.edu/toc/mre/current) by September 30, 2018. All submissions are subject to the Journal’s standard review process. There aren’t a lot of fishermen left in this town in North East England, once home to one of the largest fleet of trawlers in Britain. But nostalgia for the fishing industry permeates the place. So the result seemed inevitable when 70 percent of residents voted to leave the European Union. Britain’s fishermen have complained for years about regulations imposed on all members. Actually, what happened here is more about hearts than minds. The vote to leave was a vivid demonstration of the way emotions can transform politics and affect the economy. It’s a phenomenon found around the world, including in the United States, where the legacy and the romance of a declining industrial past often eclipse the interests of new and expanding businesses. Time and again, economic facts are no competition for sentiment and history. The once-bustling docks here would be pretty desolate were it not for 70 processing warehouses with some 5,000 employees, about one-third of whom are foreign nationals, mostly Poles and Lithuanians. To stay competitive, these companies want the kind of frictionless trade and immigration policy that they currently enjoy, and will probably lose, after Brexit. The goal of fishermen, on the other hand, is regaining full control of British waters so that they aren’t forced to compete with trawlers from other countries. A similar calculus is evident in the United States, where President Trump has promised to resuscitate coal mining. It’s an industry that now employs roughly 55,000 people, a figure that has been trending downward for years. If economic agendas were driven strictly by data, a lot more would be heard about solar power, which employs about five times the number of people. Were the manpower problem solved, others would persist. The species in Britain’s waters are scallops, crab, lobsters and other delicacies that have never been popular in this country. The fish of choice here are cod and haddock, staples of fish-and-chip shops. Those species are found closer to Norway and Iceland. Make a note to remind yourself that behavior is guided by more than economic self-interest. How are the economy (and environment) doing--without reference to politics? Since most of the major news outlets (CNN, MSNBC, FOX, Drudge (?),...) spend all of their time having partisan shouting matches, I thought I would update everyone on some ongoing economic and environmental trends, without mentioning or crediting or discrediting the contribution to those trends by any particular President past or present. I will leave the attribution of credit or blame to those who choose to participate in such attribution exercises. All data sets are pulled from the Trading Economics website. Trend lines are added to some of the graphs for your reference. Feel free to use this information in your barroom discussions. Is this the Kudlow question? Larry Kudlow doesn't have an economics degree. So, if he wasn't the National Economic Council guy, i.e., restricting eligibility for that job by requiring a graduate degree in economics, would that reduce the chances for good public policy outcomes? What does it mean if you disagree like most people on the IMG panel. That means that you think it would not reduce the changes for good public policy outcomes? Is this poorly worded question or am I a big idiot? My sophomore level environmental and resource econ course has a research component. The students are required to write an abstract suitable for submission to an undergraduate research conference. Most of the students are estimating Turnbull willingness to pay using dichotomous choice data from published papers employing regional case studies. As an exercise during the semester all of the students estimated Turnbull willingness to pay for the large and small oil spill scenarios using the same data from the BP/DWH federal study. Students who don't want to do contingent valuation for their project (aka, the "weirdos") are using experimental data (Veconlab experiments that we have conducted during the semester) to better understand environmental policy. We haven't spent much time talking about how to do this during class so I wrote, created and produced this video to help the students figure out what to do next (my allergies are bothering me so try to ignore the snorting and wiping up around my nose area). December 2007: “There’s no recession coming. The pessimistas were wrong. It’s not going to happen. ...The Bush boom is alive and well. It’s finishing up its sixth consecutive year with more to come. Yes, it’s still the greatest story never told. President Trump's top economist blasted the Congressional Budget Office on Tuesday, dismissing the scorekeeper's recent projections that the Republican tax law would push the nation's annual deficit over $1 trillion. Trump reportedly watches “Fox & Friends” regularly and often reacts to the programming either on Twitter or with proposals for action. Kudlow's remarks reflect a widespread belief in the Republican Party that the CBO has failed to adequately account for higher economic growth when estimating the tax law's effect on the deficit. The CBO said the tax law will cut government revenue by $1.8 trillion over the next 10 years, or by $1.3 trillion when factoring in potentially higher growth spurred by the law. Kudlow, a longtime television commentator who was tapped last month to lead the economic council, said CBO's estimates of growth under the law should be much higher. He argued that the tax law will create far greater economic growth than most nonpartisan forecasters estimate. Dude, chill, it's an empirical question. The tax law has been passed, I don't notice anything in my paycheck and we can find out just how much bigger the deficit is going to be when the time comes.